We describe the objectives, design and predicted performance of Clover, which is a ground-based experiment to measure the faint “B-mode” polarisation pattern in the cosmic microwave background (CMB). To achieve this goal, clover will make polarimetric observations of approximately 1000 deg^2 of the sky in spectral bands centred on 97, 150 and 225 GHz. The observations will be made with a two-mirror compact range antenna fed by profiled corrugated horns. The telescope beam sizes for each band are 7.5, 5.5 and 5.5 arcmin, respectively. The polarisation of the sky will be measured with a rotating half-wave plate and stationary analyser, which will be an orthomode transducer. The sky coverage combined with the angular resolution will allow us to measure the angular power spectra between 20 < l < 1000. Each frequency band will employ 192 single polarisation, photon noise limited TES bolometers cooled to 100 mK. The background-limited sensitivity of these detector arrays will allow us to constrain the tensor-to-scalar ratio to 0.026 at 3sigma, assuming any polarised foreground signals can be subtracted with minimal degradation to the 150 GHz sensitivity. Systematic errors will be mitigated by modulating the polarisation of the sky signals with the rotating half-wave plate, fast azimuth scans and periodic telescope rotations about its boresight. The three spectral bands will be divided into two separate but nearly identical instruments – one for 97 GHz and another for 150 and 225 GHz. The two instruments will be sited on identical three-axis mounts in the Atacama Desert in Chile near Pampa la Bola. Observations are expected to begin in late 2009. Had it gone ahead, Clover would have started taking data at around the same time as BICEP2 (perhaps even a bit earlier). Clover was originally intended to be positioned at the South Pole, where observing conditions are better than in Chile and where BICEP2 is placed, but this was in the middle of STFC’s financial crisis and running costs would have been much higher than the alternative location in Chile. This might have had a negative impact on its sensitivity. 10.45am. I came in this morning determined to get on with some work to distract my attention from the looming announcement of budget cuts from the Science & Technology Facilities Council (STFC). I was up nearly all night worrying about the future, especially for the current generation of postdocs whose careers I’m pretty sure are going to sacrificed in large numbers to balance the books. It reminded me a bit about a poem I posted a while ago: I could not sleep for thinking of the Sky STFC. Anyway, I’ve spent over an hour trying to write one paragraph of the paper I’m trying to finish and I can’t settle so I thought I’d start a post, with the intention of updating it as the day goes on, the picture gets a bit clearer, and I become increasingly suicidal. Paul Crowther at Sheffield has kept up with all the ongoings and downturnings at STFC and you can expect him to understand it better and quicker than the rest of us here. There’s a very good (and nearly anonymous) post about all this on the blog To Left of Centre. The e-astronomer (Andy Lawrence at the ROE) has written about this and a lot of important people have commented on it. Rob Simpson, a PhD student here in Cardiff, is probably expressing the fears of many younger researchers as is Sarah Kendrew who gives a postdoc perspective. 11.50am. WICKET! Prince c Collingwood b Swann 45. Oh sorry. Wrong blog. So I’d almost forgotten that other countries are out there, facing the Great Recession as well, and making really stupid decisions in the face of it. IMHO one example of blatant incompetence in an economic sense is being perpetrated by none other than the UK. We kind of look up to them, don’t we? It’s the accent or something. But they are busy tossing some of their world-renowned science, and much of their past investment in such, out the door rather than restructure some of their government funding. Talk about inertia. Their astronomy program appears to be particularly hard-hit. Interesting way to close 2009, the International Year of Astronomy. I couldn’t agree more. It also reminded that I haven’t made enough of the irony that this is indeed the International Year of Astronomy. For a lot of people it will be the last year they’ll be doing astronomy. 12.25pm. Meanwhile, our man in Madrid, Matt Griffin has been wowing the audience with some of the new results from Herschel. I hope to be able to post a few of them later when the official workshop results go live. 13.15pm. It’s tea-time in sunny South Africa (with the home side at 159-4) but here in Blighty it’s the long dark lunch break of the soul, waiting for news of the inevitable. 13.30pm. Half an hour to go. Most of the astronomers in the department have now left to travel to Madrid for the big workshop starting tomorrow. They tell me the new results probably won’t be available for public consumption until Friday (18th December). Nothing to sugar the pill, then. 13.55pm. I’m not often right, but I was wrong again. 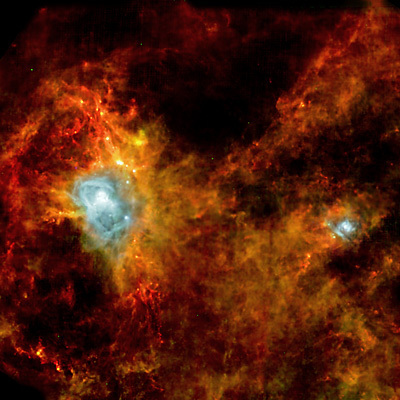 I’ve just noticed that there is already an ESA press release that includes this stunning image of a star-forming region in the constellation of Aquila made using both PACS and SPIRE observations. This is just a first look at part of an extended survey of stellar nurseries that Herschel will be undertaking over the forthcoming months. 14.00pm. And there were are, right on cue. Here is the announcement. As expected, there is a ridiculous attempt to put a positive spin on it all, but you will find immediately, sigh, another 10% cut in research grants to universities (on top of the 25% we already had) to reduce the amount of “exploitation”, plus 25% cuts in the number of PhD students and fellowships “mirroring the overall reduction in the programme”. I read that as meaning that STFC wants, in the long term, about 25% of the astronomers in the UK to go somewhere else and, preferably, never come back. I’ll post more when I’ve read the details. Note that both Aurora and Bepi-Colombo were both rated very low on scientific grounds but have been retained in the programme, presumably for political reasons. However, the big downside for everyone is the cut in university grants for “exploitation” that I mentioned above. STFC wants to have lots of expensive facilities, but doesn’t want to fund the modest among of staff needed to actually get science out of them. The stupidity of this decision is made even more depressing by its inevitability. Even the top-rated projects are getting cuts to their funding. It just shows how little thinking is going on about the actual science that STCF is supposed to be supporting. Isn’t it a more sensible strategy to do a few things well, rather than a lot of things poorly? It’s a mess. 14.38pm. From a Cardiff perspective this is nowhere near as bad as it could have been, but is still pretty dire. The primary activities for our current astronomy programme, Herschel and Planck, are both very high in the priority list and the relativity group is relieved to see ground-based gravitational wave research, including Advanced LIGO, at the highest priority. Moreover, it looks like what I feared most of all – an immediate clawback of existing grants with consequent immediate redundancies – is not going to happen, owing to what appears to be a last-minute injection of funds from RCUK. We’re still looking at cash cuts though, and we’re vulnerable because so much of our research income comes from STFC. 14.43pm. Not on the STFC webpage, but it appears that they are not going to support LOFAR-UK either. 15.05pm. If you want to read the full outcome of the prioritisation exercise, in terms of a batting order of projects, you can download it here. It includes a recommendation that the top funded (alpha-5) projects should get a 15% cut and those at the next leveldown (alpha-4) should get a 20% cut. However, things will probably turn out worse than that because those cuts were suggested on the basis that only those projects would be funded at all. As it turns out, some alpha-3 projects have made it through also, so the cuts to the higher-rated projects must be larger to compensate. Mustn’t they? Ongoing support for public outreach and science communication, through continuance of our award schemes and Fellowships, and public engagement and communications, helping to ensure new generations of children are enthused and inspired by science, and encouraged to continue study in science, technology, engineering and mathematics (STEM) subjects. ..so we can kick them in the teeth when they’ve just started a scientific career. Is there a possibility that a light has gone on somewhere to the effect that something must be done to stop STFC killing University research? I hope so. If he can pull something out of the fire before March 2010, though, I’d be very impressed. discussions would be held in coming months with national and international partners, including universities, departments and project teams, on implementation of the investment strategy. This will include discussions with EPSRC and the University funding councils on the impact of these measures on physics departments in universities. 16.18pm. Press statements from Jocelyn Bell-Burnell, President of the Institute of Physics here and Andy Fabian, President of the Royal Astronomical Society here. 19.45pm Before I settle down with my gramophone records for the evening, I just thought I’d remind anyone not sufficiently depressed at the state of STFC that the drastic cuts announced today do not take account of whatever share of the £600 million “efficiency savings” announced in the budget has been allocated to them. It may look bad now, but it’s probably going to get worse. On that cheery note, I’m going to have a drink and listen to Mahler. Yesterday, Paolo Calisse and I were paid a visit by a reporter (Martin Shipton) and a photographer from Welsh newspaper The Western Mail who wanted to cover the sad story of Clover. Paolo is heavily involved with Clover, but I was a bit hesitant about doing this because I’m not really part of the Clover team. Paolo suggested it might be an advantage that I wasn’t so directly involved as I might be able to give a more balanced view of the importance of the experiment than him. Anyway, the story came out today in the newspaper and is available online too. 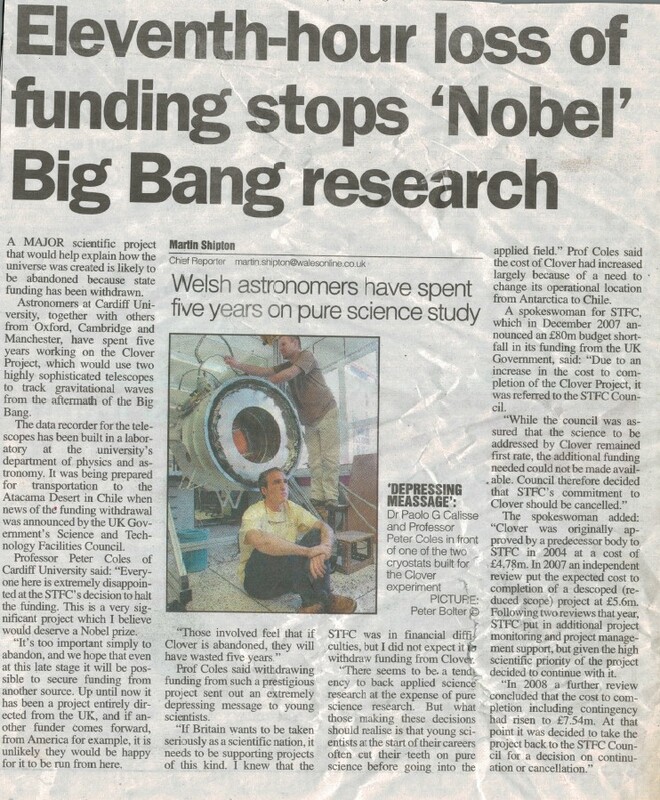 In the same issue of the paper there is another feature about Cardiff’s astronomy research, concerning BLAST (Balloon-borne Large Aperture Submillimetre Telescope). This is a much happier story, as it marks the release of results from a highly successful science run from 2006. In the print version of the Western Mail the two stories were run on the same page, one above the other, making very effectively the point that cutting the funding of the Astronomy Instrumentation Group jeopardizes a great deal of world-leading research besides Clover itself. And when I say “world-leading” I mean it, whatever the RAE panel might have thought. We detect correlations in the cosmic far-infrared background due to the clustering of star-forming galaxies, in observations made with the Balloon-borne Large Aperture Submillimeter Telescope (BLAST), at 250, 350, and 500 microns. Since the star-forming galaxies which make up the far-infrared background are expected to trace the underlying dark matter in a biased way, measuring clustering in the far infrared background provides a way to relate star formation directly to structure formation. We test the plausibility of the result by fitting a simple halo model to the data. We derive an effective bias b_eff = 2.2 +/- 0.2, effective mass log(M_eff/M_sun) = 13.2 (+0.3/-0.8), and minimum mass log(M_min/M_sun) = 9.9 (+1.5/-1.7). This is the first robust clustering measurement at submillimeter wavelengths. Submillimetre surveys during the past decade have discovered a population of luminous, high-redshift, dusty starburst galaxies. In the redshift range 1 <= z <= 4, these massive submillimetre galaxies go through a phase characterized by optically obscured star formation at rates several hundred times that in the local Universe. Half of the starlight from this highly energetic process is absorbed and thermally re-radiated by clouds of dust at temperatures near 30 K with spectral energy distributions peaking at 100 microns in the rest frame. At 1 <= z <= 4, the peak is redshifted to wavelengths between 200 and 500 microns. The cumulative effect of these galaxies is to yield extragalactic optical and far-infrared backgrounds with approximately equal energy densities. Since the initial detection of the far-infrared background (FIRB), higher-resolution experiments have sought to decompose this integrated radiation into the contributions from individual galaxies. Here we report the results of an extragalactic survey at 250, 350 and 500 microns. Combining our results at 500 microns with those at 24 microns, we determine that all of the FIRB comes from individual galaxies, with galaxies at z >= 1.2 accounting for 70 per cent of it. As expected, at the longest wavelengths the signal is dominated by ultraluminous galaxies at z > 1.
resulting in much lower error for the derived shape of the 250-500 micron continuum. The overall pointing error is <5″ rms for the 36, 42, and 60″ beams. The performance of the optics and pointing systems is discussed. We present the 250, 350, and 500 micron detection of bright submillimeter emission in the direction of the Bullet Cluster measured by the Balloon-borne Large-Aperture Submillimeter Telescope (BLAST). The 500 micron centroid is coincident with an AzTEC 1.1 millimeter detection at a position close to the peak lensing magnification produced by the cluster. However, the 250 micron and 350 micron emission is resolved and elongated, with centroid positions shifted toward the south of the AzTEC source and a differential shift between bands that cannot be explained by pointing uncertainties. We therefore conclude that the BLAST detection is contaminated by emission from foreground galaxies associated with the Bullet Cluster. The submillimeter redshift estimate based on 250-1100 micron photometry at the position of the AzTEC source is z_phot = 2.9 (+0.6/-0.3), consistent with the infrared color redshift estimation of the most likely Spitzer IRAC counterpart. These flux densities indicate an apparent far-infrared luminosity of L_FIR = 2E13 L_sun. 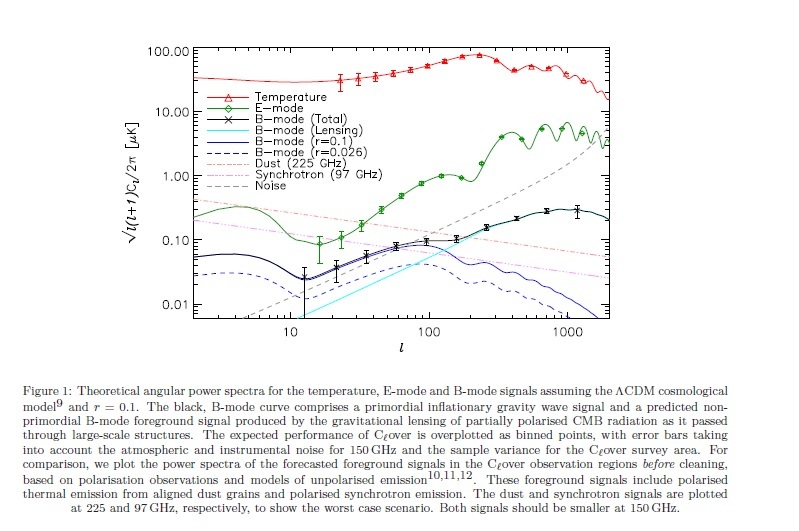 When the amplification due to the gravitational lensing of the cluster is removed, the intrinsic far-infrared luminosity of the source is found to be L_FIR <= 1E12 L_sun, consistent with typical luminous infrared galaxies. constitutes the public release of the multi-wavelength catalog of >= 5 sigma BLAST sources contained within the full ~ 9 sq. degree survey area. The Balloon-borne Large Aperture Submillimeter Telescope (BLAST) has made one square-degree, deep, confusion-limited maps at three different bands, centered on the Great Observatories Origins Deep Survey South field. By calculating the covariance of these maps with catalogs of 24 micron sources from the Far-Infrared Deep Extragalactic Legacy Survey (FIDEL), we have determined that the total submillimeter intensities are 8.60 +/- 0.59, 4.93 +/- 0.34, and 2.27 +/- 0.20 nW m^-2 sr^-1 at 250, 350, and 500 microns, respectively. These numbers are more precise than previous estimates of the cosmic infrared background (CIB) and are consistent with 24 micron-selected galaxies generating the full intensity of the CIB. We find that more than half of the CIB originates from sources at z >= 1.2. At all BLAST wavelengths, the relative intensity of high-z sources is higher for 24 micron-faint sources than it is for 24 micron-bright sources. Galaxies identified very broadly as AGN by their Spitzer Infrared Array Camera (IRAC) colors contribute 32-48% of the CIB, although X-ray-selected AGN contribute only 7%. BzK-selected galaxies are found to be brighter than typical 24 micron-selected galaxies in the BLAST bands, and contribute 32-42% of the CIB. These data provide high-precision constraints for models of the evolution of the number density and intensity of star-forming galaxies at high redshift. We use measurements from the Balloon-borne Large Aperture Sub-millimeter Telescope (BLAST) at wavelengths spanning 250 to 500 microns, combined with data from the Spitzer Infrared telescope and ground-based optical surveys in GOODS-S, to determine the average star formation rate of the galaxies that comprise the cosmic infrared background (CIB) radiation from 70 to 500 microns, at redshifts 0 < z < 3. We find that different redshifts are preferentially probed at different wavelengths within this range, with most of the 70 micron background generated at z < ~1 and the 500 micron background generated at z >~1. The spectral coverage of BLAST and Spitzer in the region of the peak of the background at ~200 microns allows us to directly estimate the mean physical properties (temperature, bolometric luminosity and mass) of the dust in the galaxies responsible for contributing more than 80% of the CIB. By utilizing available redshift information we directly measure the evolution of the far infrared luminosity density and therefore the optically obscured star formation history up to redshift z ~3. We present first results from an unbiased, 50 square degree submillimeter Galactic survey at 250, 350, and 500 microns from the 2006 flight of the Balloon-borne Large Aperture Submillimeter Telescope (BLAST). The map has resolution ranging from 36″ to 60″ in the three submillimeter bands spanning the thermal emission peak of cold starless cores. We determine the temperature, luminosity, and mass of more than a thousand compact sources in a range of evolutionary stages and an unbiased statistical characterization of the population. From comparison with C^18 O data, we find the dust opacity per gas mass, kappa/R = 0.16 cm^2/g at 250 microns, for cold clumps. We find that 2% of the mass of the molecular gas over this diverse region is in cores colder than 14 K, and that the mass function for these cold cores is consistent with a power law with index alpha = -3.22 +/- 0.14 over the mass range 14 M_sun < M < 80 M_sun, steeper than the Salpeter alpha = -2.35 initial massfunction for stars. Additionally, we infer a mass dependent cold core lifetime of tau(M) = 4E6 (M/20 M_sun)^-0.9 years — longer than what has been found in previous surveys of either low or high mass cores, and significantly longer than free fall or turbulent decay time scales. This implies some form of non-thermal support for cold cores during this early stage of star formation. You can find a lot more detailed information on the dedicated BLAST website. Just a quick note for those interested in the story of Clover, Physics World have run a news item on their website. You may also like to read the article by Alan Heavens over on the e-astronomer. Another update (9th April). Welsh Newspaper The Western Mail has now run a story on the clover cancellation and there was a short item on the BBC Radio Wales News this evening. Another update (14th April). A statement from Walter Gear, Principal Investigator of the Clover project, about the current status of Clover has been placed on the Cardiff University School of Physics & Astronomy web pages. Science projects don’t get much purer than CLOVER, an experiment designed to search for evidence of the existence of primordial gravitational waves by making ultra-sensitive measurements of the polarisation of the cosmic microwave background. From its vantage point in the Atacama Desert in Chile, CLOVER was intended to probe the state of the universe when it was less than a billionth of a billionth of a second old, to test our understanding of the Big Bang theory. Unfortunately, the Science and Technology Facilities Council says it is cancelling funding for the experiment. Gravitational waves have been studied theoretically and are known to be intimately related to the structure of space-time itself, the understanding of which is arguably the fundamental goal of modern science. The first discovery of the presence of gravitational waves will lead to the emergence of a brand new area of physics. In anticipation of this new science, the CLOVER team—entirely British, with members in the universities of Cardiff, Cambridge, Oxford and Manchester—has established a technical capability in the UK that is second to none. Cancellation will prevent the team from making direct experimental observations of the universe that would not only have been of immense scientific importance, but could also have had deep cultural significance. So if CLOVER is so good, why is it being cancelled? to be found. Second, there were delays due to technical challenges, such as the need to develop some of the world’s most sensitive far-infrared superconducting cameras. So, the CLOVER team was unable to complete the project within the original budget, and went back to the STFC to request extra money. This brought a third factor into play. Since 2007, the research councils, including the STFC, have changed their method of funding university-based research. In the new full-economic-costs regime, costs are substantially higher than at the time of the original award. These elements combined to leave the CLOVER team with a shortfall of about £2.6m, bringing the overall cost to completion to about £7.5m, although the increase in resources required would be only around 20 per cent if calculated on the pre-FEC basis of the initial funding. Unfortunately, despite receiving strong support from the scientific community and being rated extremely highly in recent prioritisation exercises, the STFC Council has decided that it does not have the funds and has abruptly cancelled the CLOVER experiment. Observatory. The balance sheet of the STFC is now in total disarray. CLOVER is the first casualty in what may become a large-scale cull of fundamental science projects. The STFC’s decision on CLOVER means that an important instrument will be lost, and the millions already spent on it wasted. The technology will be difficult to replace. The many gifted scientists who have been working on CLOVER will have to leave the UK to continue in the field, and are unlikely to return. Their fate is unlikely to tempt younger people into a career in science either. In cancelling CLOVER, the council has effectively closed the door on UK involvement in cosmic microwave background science in general, an area that has already led to two Nobel prizes for physics. The decision also provides worrying evidence that the STFC seems to be turning away from fundamental science towards technology- driven projects. For example the lunar probe Moonlite has recently won funding for initial development studies without ever passing through the rigorous peer review required of CLOVER. If this really is the way the STFC is going, then we may be witnessing the beginning of the end for British astronomy. Dead heads caused spring pain. Our little dream; we’re the losers. After The Waste Land, Part I: The Burial of the Dead, by T.S. Eliot.